I had a moment of zen with my Arabic the other day. I was riding in a taxi from the Old Medina to the Ville. The taxi was full and the driver and two other passengers, all men, struck up a conversation about the day's big news: a soccer match between MAS and WAF, Fes' competing professional soccer clubs. To my delight, I was able to follow along almost perfectly. It was around the end of rush hour, so the roads were still packed. The conversation drew out along the course of our ride. After discussing the reasons MAS would win the game (which they eventually did) they shifted to talking about other teams and who they were playing and were very contentious about whether Raja, the famed Casablanca club, was to play at home or in Al-Hoceima, in northern Morocco. The other passengers said they'd like to get out as we neared La Fiat, a prominent roundabout and landmark that marks the beginning of the Ville Nouvelle. The driver pulled off to the right, out of the stream of cars and trucks meandering around the traffic circle. The man sharing the backseat with me tried to exit from the driver's side passenger door, but the traffic too intense. We waited as he kept attempting to open his door while avoiding oncoming cars, but was unsuccessful. 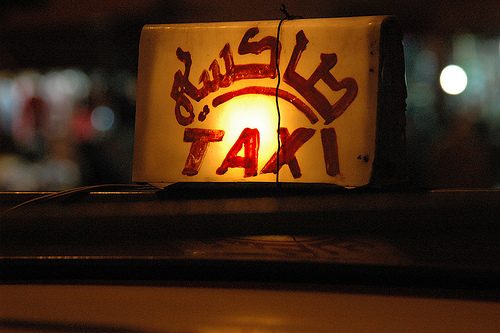 Speed is a virtue highly valued in the Moroccan taxi culture. Dawdling around as you leave a cab (unless if you're an old man or woman) earns you only the scorn of the driver who is thinking about the other fares he's missing while he waits for you. I got out and told the man, with the appropriate Moroccan Arabic mn hnna, to exit from my door, which he did. When I got back in the cab I executed another culturally appropriate maneuver: I moved to the front passenger seat, a signal to the driver that he can pick up other fares. Up to this point, I was playing the game just right. Between my appearance, my etiquette, and my language, I had been able to seem Moroccan, or maybe just not like a Westerner. The driver confirmed this to me when, after I commented about the traffic, he launched into a lengthy and very rapid monologue of something that I didn't understand except for the hamdulillah that punctuated its conclusion. And that's when I knew I had lost it. He was laughing, so I laughed, but I didn't want to respond to him. Not only did I not know what he had said, but I knew if I responded it would reveal that I'm not Moroccan and that my Arabic is not great. I wanted to savor the moment of inclusion, the delight that comes with defying the native-foreigner dichotomy. But moments like these, if they happen, are fleeting. As hard as I may try, I'll never be Moroccan. Assimilation is a phenomenon any student study or expatriate living abroad has to confront. To what extent to you strive to adapt to and adopt facets of the local culture? For me, assimilating to Moroccan culture draws me closer to language of the people. It's certainly possible for locals to talk freely, naturally in the presence of a foreigner, especially if they don't think he can understand what they're saying. But in my opinion, being mistaken as a local, or being considered like one, gives you direct access to the language in a pure form. You can familiarize yourself with the subtleties and nuances of the language that go well beyond the scope of a classroom or textbook. And so I try to be Moroccan from time to time, and I succeed every now and then, at least for a moment. I so enjoyed this one, great post. And as a Moroccan friend, you are probably the only American I know who's almost more Moroccan than American!